A source of inspiration for sewing, knitting, and quilting from an economical perspective. I’ve been trying to contact friends in the effected areas of Sandy and I have been successful on several accounts, but not all. My prayers and thoughts are with everyone in the North East and the aftermaths of Hurricane Sandy. I was watching the news and couldn’t stop last week, my daughter lives in Manhattan and I felt like I had to keep vigil and watch to see if I could find her on the TV. I know it’s crazy…. even though she told me she was fine, I had to see to believe. Thankfully, she and her sister skype and text with pictures so I don’t feel guilty posting today. My heart still goes out to the lady in New Jersey who, on the news just wanted to go home. I pray for her everyday and for all of those who have lost so much. 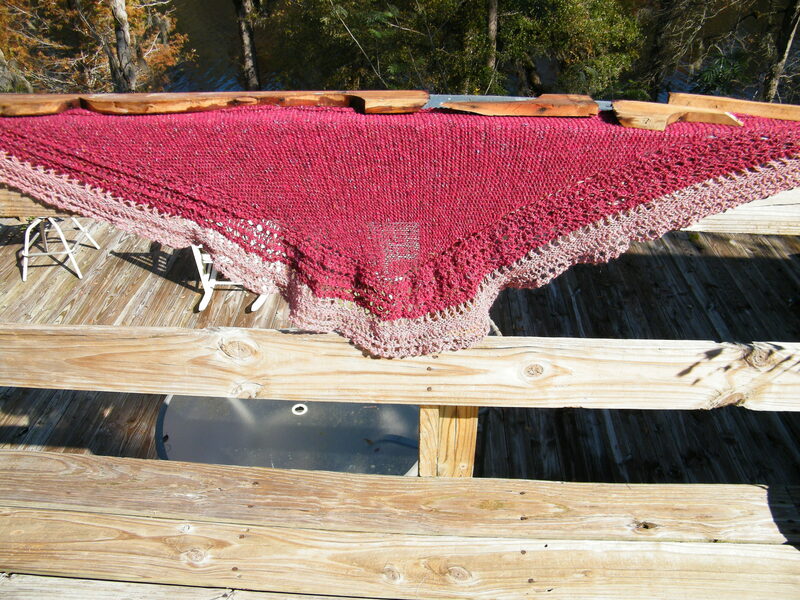 In order to keep my nervous energy in check, I finished knitting another Henslowe Shawl. This is not blocked yet so it’s still a bit out of shape. I like the two colors of yarn and I will post another photo after it is blocked. The gift sale is post-poned a week until November 17th. I will post all the information as it released…. Terri, glad your daughter is OK. I breathed a sigh of relief when Sandy stayed away from my FL coast…but then to see where it was heading. Slowly hearing from peeps in NJ, NYC, NE. Friends in Brooklyn are OK but the entire 1st floor of their home is damaged from flooding. Spent my vigil painting & fixing up “junk” for next flea mkt on the 24th. Trying to get things ready before busy holiday & snowbird season! Should get out the machine & do up a few quilts to send to relief groups. Great news that your daughter is okay! I understand nervous energy–I bet you could have knitted a trunk full of shawls and afghans while you were waiting to hear from her. Your shawl is lovely. I really like lacy knitting. Shobori dying! A new rabbit hole!